:The very existence of HGTV, the DIY movement, and Pinterest proves we love great design. We adore plans and perfectly staged rooms. But what happens when we discover we are living a life we did not design? When our dreams lie in tatters or when we experience loss of any kind? What happens when life feels like one big Pinterest fail? Where is God in the midst of what doesn't make sense? Does he care? Drawing from time-honored design principles such as movement, contrast, and pattern, former interior designer and Bible teacher Tracy Steel offers frustrated and discontented women the assurance that God is their ever-present, caring Designer. With a mix of wit and wisdom, Tracy proves through biblical examples and personal testimony that God remains true to his plans and purposes, accomplishing them in and through us in every season of life. She helps us recognize God's design principles, enabling us to embrace our sometimes messy lives, especially when they're ones we never would have designed for ourselves. 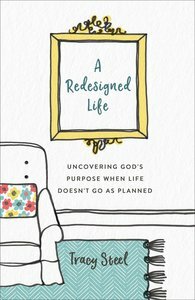 About "A Redesigned Life: Uncovering God's Purpose When Life Doesn't Go as Planned"